Our fifth game is entitled Series Finale. 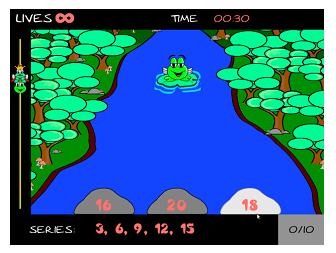 The object of the game is to win the race against the King frog while answering series problems along the way. The answer to every question is chosen by selecting and breaking the rock (i.e., swinging the Wii Remote down) that contains the next number in the sequence. Lately, staying at the laboratory has made me nervous. Excited on acquiring our brand new Wiis, we immediately booted the PC so that its operating system is Linux. First task, install the latest java. 😀 Easy, right? But what we always get after downloading the latest jdk (which took several minutes) is a corrupted file. As we believed that patience is a virtue, we just repeated the download for almost… ten times? XD Already disappointed with so much time wasted, I decided to try another site that offers a way on how to install java via the terminal (You see, I am a little bit ignorant with Linux. XD). Next task, Avetana installation. Following Stuart’s blog, I got along just fine extracting here and there, editing environment variables, until the command sudo ./install did not work. During this time, I decided to pass the task to my partner. After a few minutes, with the help and support of a member from MyMathVenturesJR, they did it! 😀 Some forums turned out to be really helpful. Since other persons who tried the installations we were doing sometimes encountered same problems. Gaussian elimination, lower triangular matrix, M1M2 must be equal to M2M1… In the middle of this CS131 lecture, my thesis partner’s phone beeped. The message came from another one of Sir Caro’s advisees. We were actually scheduled to present our review of related literature today at 2:30pm. It was pure bliss that at last I have a reason to get out from the class earlier. Yet, I still found it rather impolite to just walk out from the room together with my partner. After gathering our guts, we finally managed to sneak out from the room and sprint upstairs back to WSG lab.